On our last trip to Mexico, we rented a condo through Airbnb. Unfortunately, I booked in a hurry, and didn’t notice that our condo didn’t have a washer or dryer. Argh! There I was, washing clothes in the sink and bathtub on holiday, with water everywhere, when we needed clean clothes the next day. Definitely not much fun. 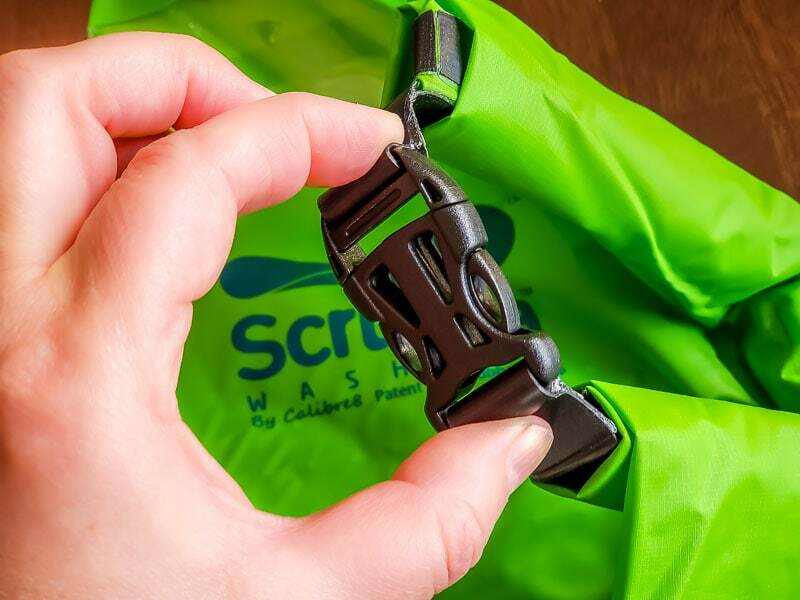 So, when the folks at Scrubba , a portable wash system, reached out to us for a review, I was curious to try it. What is Scrubba? It’s a pocket sized device for washing clothes anywhere, that claims machine quality wash in minutes. 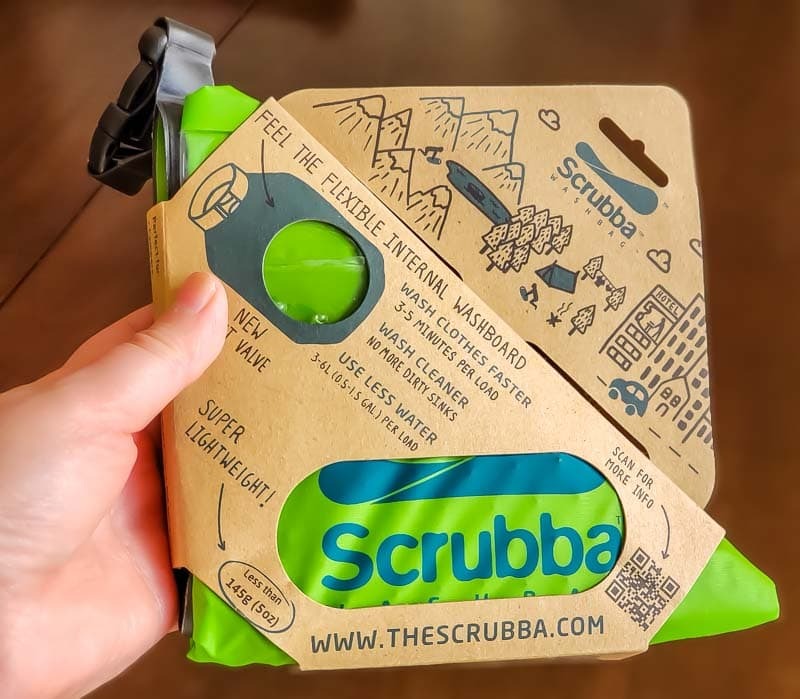 In this Scrubba review, we give the Scrubba a real world test washing our clothes, and tell you what we like, and what we don’t like. Who is the Scrubba good for? Anyone staying where there isn’t a washer handy. If you’re traveling on an budget and don’t want to pay for laundry services. If you’re staying in a remote area. Campers or people staying in an RV. Gym goers who want to clean smelly gym clothes between washes. For people that like to pack light. For parents whose babies go through clothes way too fast. 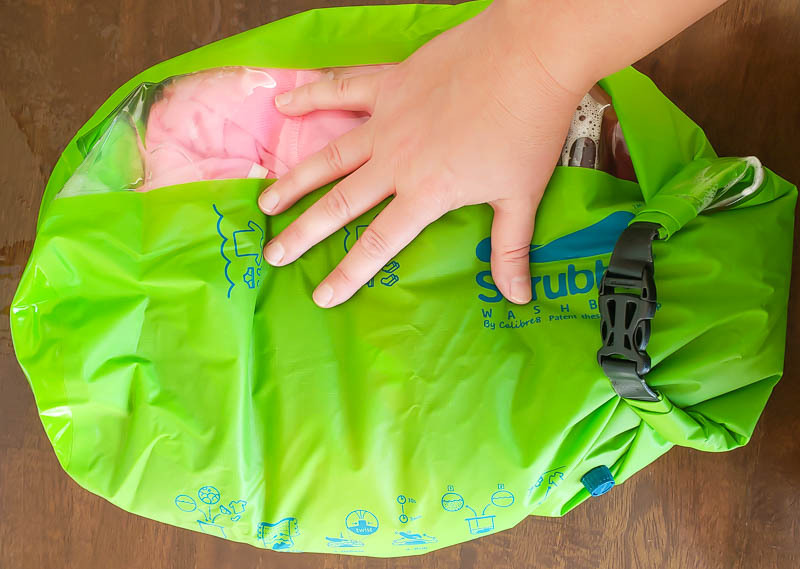 Even if you’re not a traveler, I could see Scrubba being useful if you don’t have a washer or if you’re on a budget. How does the Scrubba work? The Scrubba is pretty easy to use. Just add water, laundry liquid and clothing. Roll shut, and release excess air. Then rub gently to wash, rinse and then hang clothes to dry. 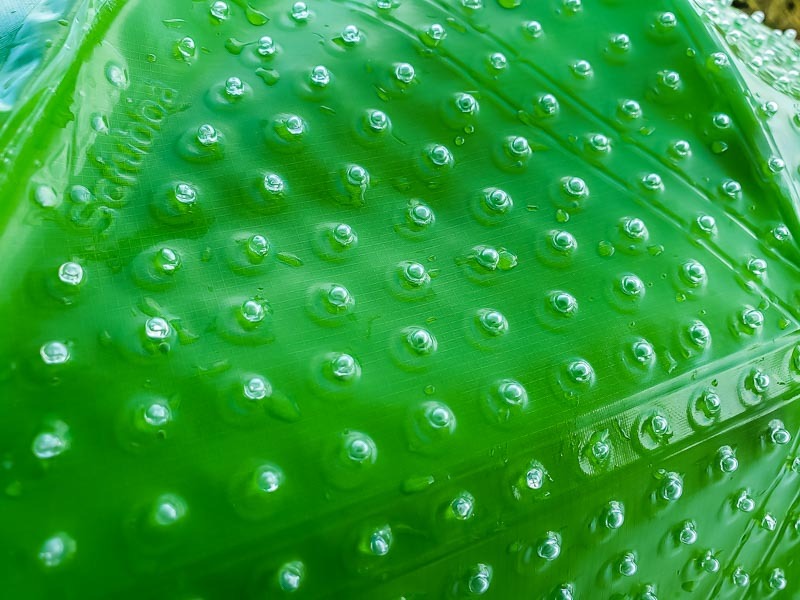 There are a few tricks to make using the Scrubba a bit easier – check them out. First, put your clothes inside the Scrubba washbag. 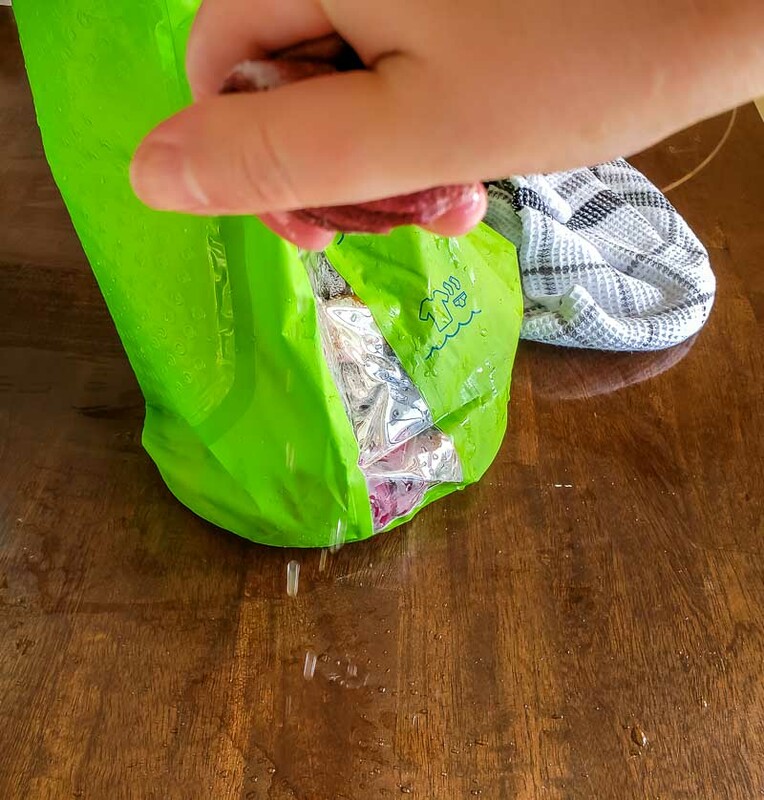 Fill with water to the level marked on the bag. Make sure the water is warm, and not too hot. You can use cold, but it won’t work quite as well, and you’ll need to wash for longer. Add liquid clothes washing soap. Solid clothes washing powder takes longer to dissolve, so we don’t recommend it unless you don’t have liquid soap around. Of course, when we’re traveling, we rarely carry clothes washing liquid, so in a pinch we’ve used shampoo or dish washing soap to clean our clothes. Both work well, but liquid washing soap works best. Roll the top down, and clip the buckle. Make sure the buckle is secure! 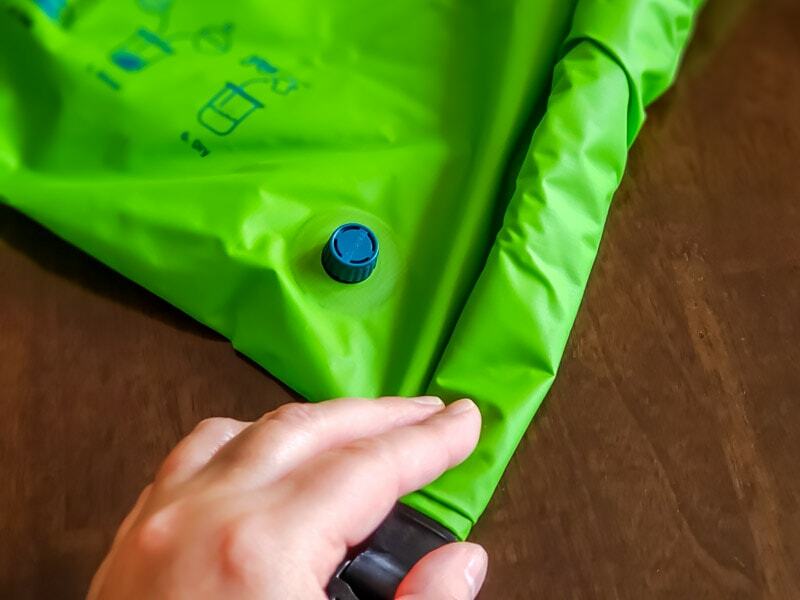 Release the air from the washing bag using the valve by twisting it open. Left to open, right to close. IMPORTANT: Make sure you close the valve during washing! Rub clothes in Scrubba for 30 seconds for a quick rinse, or 3 minutes for a full wash. Bulky items like jeans or sweaters can take up to 5 minutes. You can see what’s happening through the see through panel. Empty dirty water, and rinse with clean water. You might need to rinse it twice if a lot of soap remains. Once the clean water is poured out, roll the clothes inside the Scrubba to get rid of the excess water. Once out of the Scrubba bag, hand wring the clothes one at a time to get rid of most of the water. We like to roll our clothes in a dry towel after we’ve wrung them out to get even more water out. We found this can really aid in the overall drying time. Now hang up the clothes to dry. Don’t forget to turn the Scrubba inside out and allow it to dry as well. How much can you wash in the Scrubba? We found that washing 2 adult t-shirts, 2 pairs of underwear and 2 pairs of socks at the same time was about the max we could wash without overfilling the Scrubba. If you’re doing kids clothes you can fit a bit more in there. If we overfilled, we found that clothes just didn’t wash or rinse well. It’s better to do a few loads of fewer clothes, than try to jam them all in one go. Thicker and heavier items like bulky jeans and heavy sweaters may take a few washes to get fully clean. There’s a lot to like about the Scrubba. The Scrubba is easy to use. You can clean clothes anywhere you have access to water. Your hands don’t get wet and messy. It doubles as a dry bag, which is great for us, as we spend a lot of time on or near the water. It uses far less water than washing in a sink or bathtub. 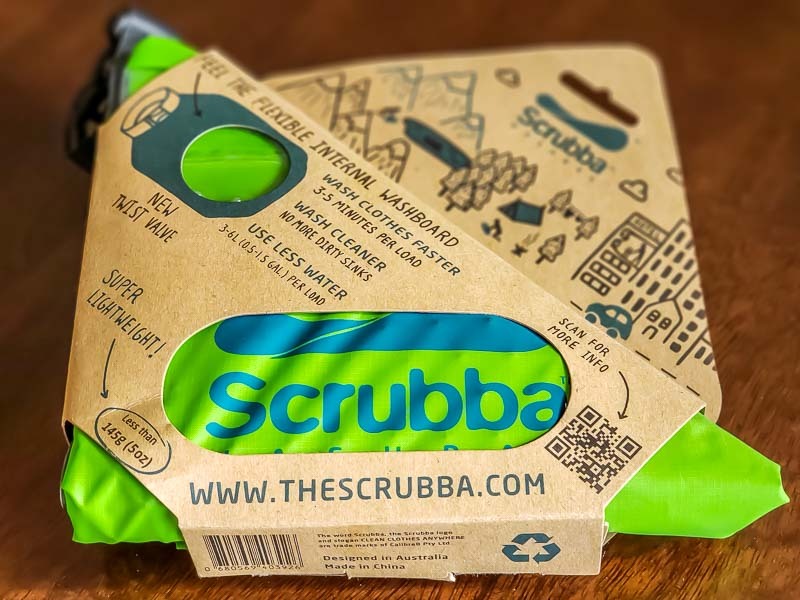 The Scrubba doesn’t need electricity to wash clothes, which is both green, and pretty convenient if you’re camping or somewhere remote. We don’t need to wash our clothes in a hotel sink or bathtub, which is always a bit gross to me. We don’t need to pay ridiculous hotel laundry fees or go searching for a local laundromat. It’s quite durable, so I think it will last a long time. 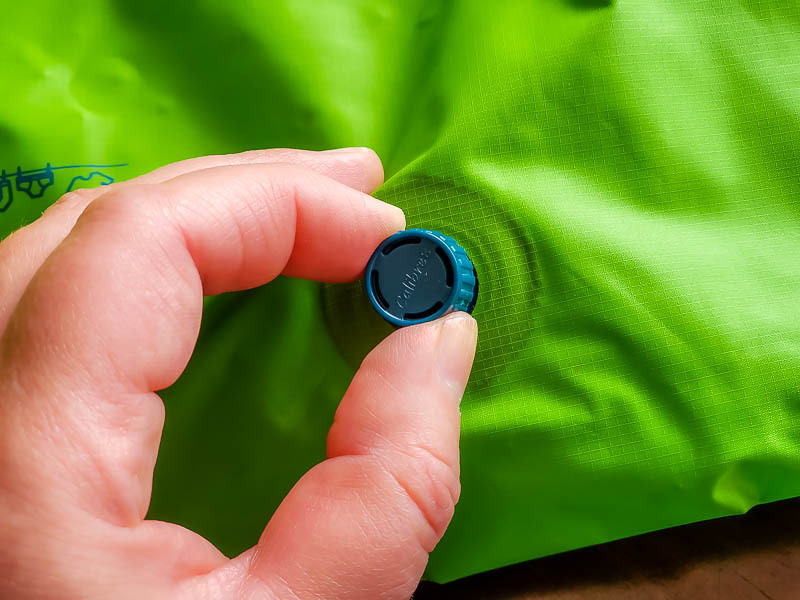 It’s lightweight, at only 5 oz, and squeezes down to a compact pocket size, which makes it perfect for travel. I love that we don’t need to cart around smelly, dirty socks until we can find a washing machine and we can store our dirty items in the bag until we have enough to do a load. The little internal washboard bumps really do seem to help get clothes cleaner faster. Here’s a closeup look at what the internal washboard looks like. You still have to wring dry your clothes. I find this is always the hardest part for me of washing clothes when we travel, since we want them as dry as possible before we have to get up and pack in the morning. Of course, this really isn’t the Scrubba’s fault, since this is a problem no matter how we wash our clothes. I’d absolutely love to see some sort of way to dry clothes faster while we travel, other than our tried and true method of squeezing water out with a dry towel. I’d definitely pay if Scrubba came up with a gadget, like a portable laundry wringer, to do this! See prices and more reviews for the Scrubba on Amazon now. Scrubba does make a travel towel that would help with this. 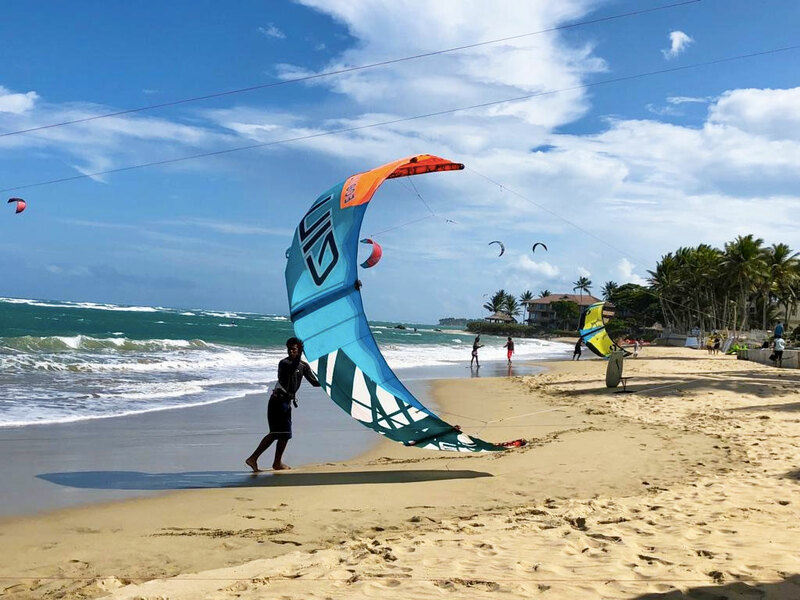 It weights about 6 oz, and is big enough to use as a beach towel at a little over 25″ x 54″. 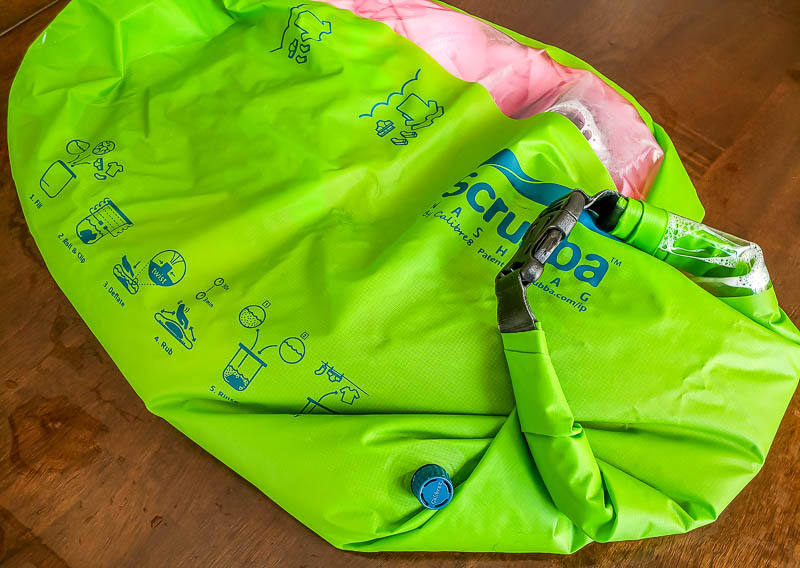 Tip: You can buy a Scrubba wash kit that includes the Scrubba wash bag, travel clothes line, travel towel, inflatable coat hangers, and carrying bag. See the Scrubba Travel Wash & Dry Kit on Amazon here. It’s a bit expensive. That said, the Scrubba is similar in price to a quality dry bag. 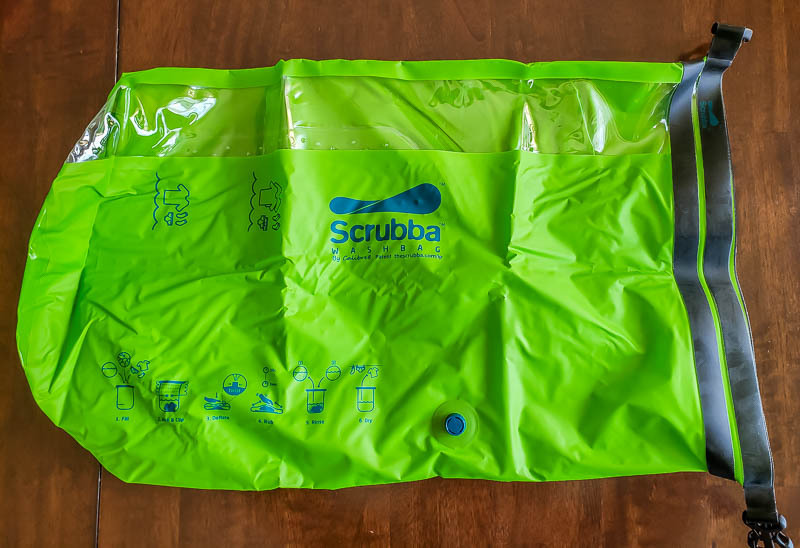 Since dry bags need to be made of high quality materials and well made to avoid any leaks they can be expensive however the Scrubba is also engineered for washing clothes so the difference in price is minimal in our mind. You can only wash small loads, with a maximum of a couple of adult sized t-shirts, socks and underwear per load. We travel as a family of four, so we need to do multiple loads to just wash our t-shirts, socks and underwear. Even if you were a single person, it would take about four loads to wash 4 t-shirts, 2 pairs of pants, 4 pairs of underwear, and 4 pairs of socks. Big, bulky items like sweaters or light jackets take two washes. Overall, we really love the Scrubba! It’s easy to pack and light, and definitely gets our clothes cleaner than washing in a sink or bathtub. Plus, it’s a lot easier to use! I’m definitely adding Scrubba to our backpack whenever I think we’ll be without a washer or dryer on our trips. 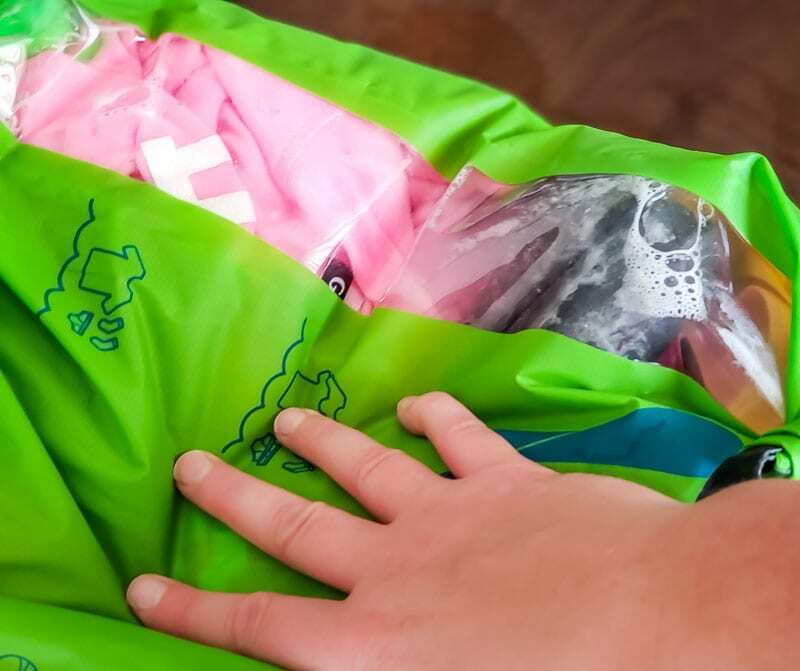 I can think of more than a few trips we’ve taken where the Scrubba would have come in handy, especially overseas, and, when the kids were younger and going through their clothes way faster than we did. If you travel often and want to cut down on the amount of clothes you travel with (or cut down on checked luggage fees altogether), I think the Scrubba would more than pay for itself. What cleaning liquid do you use in a Scrubba? Ideally, you’d use a liquid laundry detergent in the Scrubba. Since we didn’t have any on hand when we tested our Scrubba the first time, we used Dawn dish washing detergent, and our clothes washed perfectly well. You can also use shampoo or hand soap in a pinch. We’ve heard great things about concentrated camping all purpose cleaners (we haven’t tried them yet). You can use them for washing clothes, dishes, and even hair in a pinch. Just make sure you grab a small enough bottle that you can take in your carry on luggage. Campsuds gets great reviews. See Sierra Dawn Campsuds prices and reviews on Amazon here. Want to find out more about the Scrubba? See prices and Scrubba reviews on Amazon now.